Dried Cherry (Beer) Muffins - Do You Know The Muffin Man? Notes: In addition to a 375 mL bottle of Belle-Vue Kriek beer, I also used some of the leftover brandy to make a double batch of these muffins. The cherries soaked for 24 hours, making them very plump. The batter was simple to mix up as it used melted butter. Some of the reserved soaking liquid is added back, giving the muffins a sweet, yeasty taste. Instead of all white flour, I subbed a quarter of the amount with whole wheat. 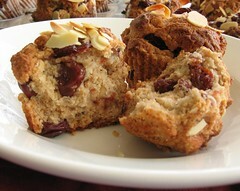 The cherries are a little tart and the almonds provide crunch; an unusual and satisfying muffin.